Hello there crafty friends! How are your Christmas preparations going? I’m pleased – and relieved to say that we have just about caught up with what we need to do! There’s still a few little gifts to get and the wrapping to do but apart from that I’m starting to feel a lot calmer than I was a couple of weeks ago! 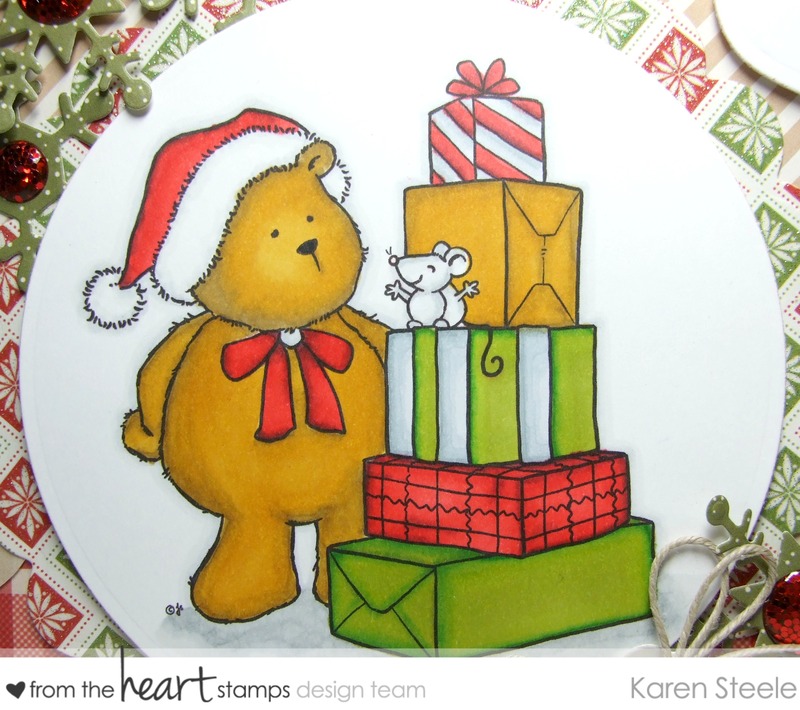 Today I’m sharing the card that I made for my children using this sweet image called Teddy Bear Stack. This is December’s Stamp of the Month over at From the Heart Stamps, which if you played along last month would have been emailed to you this month free of charge! You can still purchase this in store if you didn’t take part in last month’s challenge which would mean you would receive next months image for free! Details for the challenge can be found HERE. For this card I also used papers from First Edition Paper – Christmas Wishes, Spellbinders Circle and Scalloped Circle Dies, Spellbinders Tag and Ornament Dies, Lil’inker Bow Die, Marianne Snowflake Dies, Papermania Domed Glitter Stickers, twine, button, Sizzix Scalloped Border Die and Spectrum Noirs to colour. < Previous ‘…You put the ‘Happy’ in ‘Happy Hour!’…. Oh Karen this is Marvelous!! So wonderfully personalized and I’m sure will be appreciated. Beautiful work. Adorable Karen – he looks vintage -y (It’s a word I promise) I love all the papers you used and the embellishments are perfect – great card!! Karen, this is so sweet. I know your kids are going to love it! Beautiful choice of papers that really play off your beautifully colored image! Very CUTE card with the teddy bear and presents! Your kids will love this sweet card! So adorable! I am sure they will love it! Absolute cuteness! love the papers you’ve used to team up with this cutie too. We’re almost done now too, just got to get fresh fruit & veg, and meats on Christmas Eve.